Washington Square West or Midtown Village is a neighborhood located in Center City Philadelphia and named for Washington Square, a large urban park located in the northeastern corner of the neighborhood. It is bound by Chestnut Street to the north, South Street to the south, 7th Street to the east, and Broad Street to the west. The neighborhood has long been known as a beacon for Philadelphia’s rich cultural history and LGBT community. The area of Washington Square West located within Juniper Street, Chestnut Street, Pine Street, and 11th Street is known locally as The Gayborhood, an enclave of LGBT-friendly restaurants and shops. A former red-light district, The Gayborhood stands as the beacon for Philadelphia’s LGBT community and hosts events such as Outfest, the nation’s largest National Coming Out Day festival. 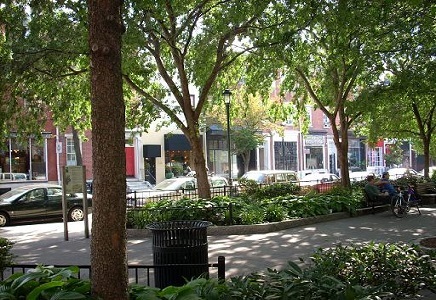 Washington Square West is also known for being a trendy neighborhood that is home to coffee shops and hip restaurants such as Garces Trading Co., Bud & Marilyn’s, Vetri Cucina, Talula’s Garden, Mercato, and Mixto. The neighborhood is also located within walking distance of nearby cultural institutions such as Independence Hall, Jeweler’s Row, The Liberty Bell, and the National Constitution Center. Center City Philadelphia’s downtown business district is conveniently located within walking distance or a few stops away on the Market-Frankford El train. The median sales price for homes in Washington Square West is $372,500 with a price per square foot of $377. The median rent per month is $2,397. The James ‘Right’ Price Team’s Philadelphia real estate acumen can find your new home in this hip, centrally-located Philadelphia neighborhood today.